Emerging markets stocks down more than 5 percent. Municipal bonds down less than 5 percent. International developed markets stocks are down 0.7 percent and taxable bonds down more than 2 percent. What time period are we discussing? 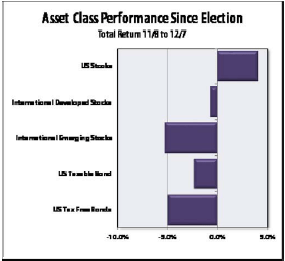 Of course, it is the major asset class returns since the election (i.e. The Trump Rally). Wait, what?! We are writing this WJNotes to set the record straight. We can debate endlessly whether the press is politically biased, but there is no question they are biased when it comes to stock market reporting. They only focus on US stocks. They almost always ignore stocks outside the US. They do discuss changes in interest rates, but bond market mathematics are not well understood. To put it simply, when interest rates go up, bond markets go down. Also keep in mind that the same press was “near certain” that a Trump victory was an impossibility and that if by some wild chance he WAS elected, there would be chaos in the markets and recession in 2017. How quickly they’ve changed their narrative. For this exact reason, we manage globally diversified portfolios because diversification provides one of the only “free lunches” in investing: returns without risk. Unfortunately, this means that portfolio performance will never match the best-performing asset class during any period; however, it also will never match the worst-performing, either. What is causing this divergence in performance? Market participants are betting on stronger economic growth in the US. Stronger economic growth in the US would likely lead to higher inflation, which leads to higher interest rates. Higher interest rates are good for the dollar, which has increased substantially since the election. Basically, asset class returns reflect this potential outcome. Bonds are down with interest rates up. US stocks are up based on faster economic growth. International stocks underperform when the dollar is strong. In addition, Trump is not a fan of offshoring, which could hurt emerging markets. A Trump tax cut would also make tax-free bonds less valuable; their significant loss reflects this possibility. One final point we would like to make: as you are aware, nothing has actually happened. Trump isn’t even president yet. Markets are only anticipating a brighter future. What if the rosy scenario doesn’t materialize? Well, we don’t really need to explain what will happen. Regardless of the election results, US stocks and bonds are still overvalued, which means returns will continue to be muted, as we have warned for a while now. If you would like to discuss your portfolio in more detail, please contact us to schedule a meeting.